OMG, please. Not Cher too! That reminds me... I'm getting hungry. Goes to fridge and munches out - forgetting everything. 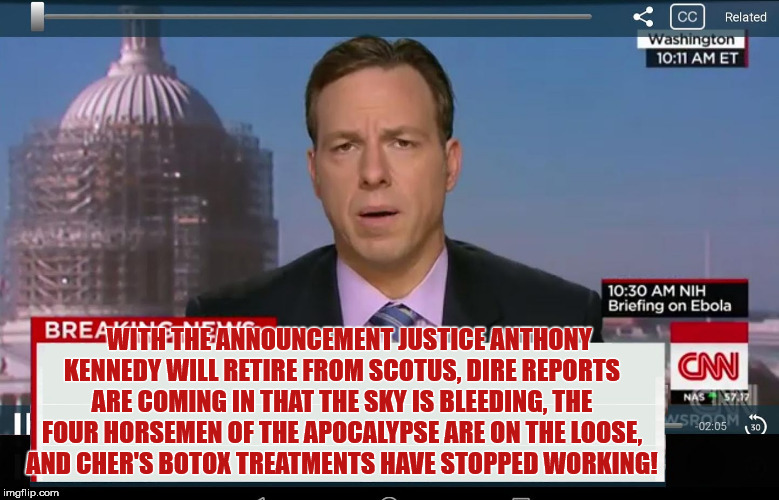 WITH THE ANNOUNCEMENT JUSTICE ANTHONY KENNEDY WILL RETIRE FROM SCOTUS, DIRE REPORTS ARE COMING IN THAT THE SKY IS BLEEDING, THE FOUR HORSEMEN OF THE APOCALYPSE ARE ON THE LOOSE, AND CHER'S BOTOX TREATMENTS HAVE STOPPED WORKING!